The de Havilland Vampire is a British jet fighter developed and manufactured by the de Havilland Aircraft Company. It was the second jet fighter to be operated by the RAF, after the Gloster Meteor, and the first to be powered by a single jet engine. 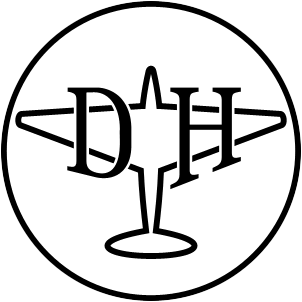 The de Havilland Aircraft Company Limited was a British aviation manufacturer established in late 1920 by Geoffrey de Havilland at Stag Lane Aerodrome Edgware on the outskirts of north London. Operations were later moved to Hatfield in Hertfordshire. Jet propulsion is the propulsion of an object in one direction, produced by ejecting a jet of fluid in the opposite direction. By Newton's third law, the moving body is propelled in the opposite direction to the jet. Reaction engines operating on the principle of jet propulsion include the jet engine used for aircraft propulsion, the pump-jet used for marine propulsion, and the rocket engine and plasma thruster used for spacecraft propulsion. Biological systems include the propulsion mechanisms of certain marine animals such as cephalopods, sea hares, arthropods, and fish. Work on the Vampire commenced during 1941 in the midst of the Second World War; it was initially intended as an experimental aircraft, albeit one that was suitable for combat, that harnessed the groundbreaking innovation of jet propulsion. Out of the company's design studies, it was quickly decided to settle on a single-engine, twin-boom aircraft, powered by the Halford H.1 turbojet engine (later produced as the "Goblin"). Aside from its propulsion system and twin-boom configuration, it was a relatively conventional aircraft. Despite being originally ordered as an experimental aircraft only, during May 1944, it was decided to mass-produce the aircraft as an interceptor for the Royal Air Force (RAF). During 1946, the first production Vampire entered operational service with the RAF, only months after the conflict had come to an end. A twin-boom aircraft is characterised by two longitudinal booms fixed to its main wing on either side of its centre line. The booms may contain ancillary items such as fuel tanks and/or provide a supporting structure for external ancillary items. Typically, twin tailbooms provide mounting points for one or more tail surfaces, although on some types such as the Rutan Model 72 Grizzly the booms run forward of the main wing. The twin-boom configuration is distinct from twin-fuselage designs. The de Havilland Goblin, originally designated as the Halford H-1, is an early turbojet engine designed by Frank Halford and built by de Havilland. The Goblin was the second British jet engine to fly, after the Power Jets W.1, and the first to pass a type test and receive a type certificate issued for an aircraft propulsion turbine. The Vampire quickly proved to be an effective aircraft and was adopted as a replacement for many wartime piston-engined fighter aircraft. During its early service, it was recognised for accomplishing several aviation firsts and various records, such as being the first jet aircraft to traverse the Atlantic Ocean. The Vampire remained in front-line service with the RAF up until 1953; after this date, it was progressively reassigned to various secondary roles, such as ground attack missions and pilot training operations, for which specialist variants of the type were produced. During 1966, the Vampire was officially retired by the RAF, having been withdrawn from its final role as an advanced trainer after having been replaced by the Folland Gnat. The Royal Navy had also adopted the type as the Sea Vampire, a navalised variant suitable for operations from its aircraft carriers. It was the service's first jet fighter. The Folland Gnat is a British compact swept-wing subsonic fighter aircraft that was developed and produced by Folland Aircraft. Envisioned as an affordable light fighter in contrast to the rising cost and size of typical combat aircraft, it was procured as a trainer aircraft for the Royal Air Force (RAF) as well as by export customers, who used the Gnat in both combat and training capacities. The Vampire had been exported to a wide variety of nations and was operated across a plethora of theatres and climates across the world. 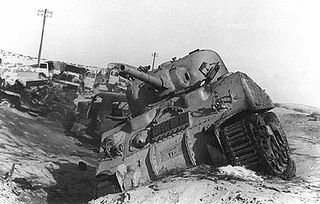 Several countries deployed the type in combat during several conflicts, including the Suez Crisis, the Malayan Emergency, and the Rhodesian Bush War. By the end of production, almost 3,300 Vampires had been manufactured, a quarter of these having been manufactured under licence in several other countries. In addition, de Havilland pursued the further development of the type; major derivatives produced include the DH.115, a dedicated dual-seat trainer, and the more advanced DH.112 Venom, a refined variant furnished with a swept wing (instead of the straight wing of the Vampire) and orientated towards conducting ground attack and night fighter operations. The Malayan Emergency was a guerrilla war fought in pre- and post-independence Federation of Malaya, from 1948 until 1960. The belligerents were the Commonwealth armed forces against the Malayan National Liberation Army (MNLA), the military arm of the Malayan Communist Party (MCP). Centrifugal compressors, sometimes called radial compressors, are a sub-class of dynamic axisymmetric work-absorbing turbomachinery. Major Frank Bernard Halford CBE FRAeS was an English aircraft engine designer. He is best known for the series of de Havilland Gipsy engines, widely used by light aircraft in the 1920s and 30s. The Minister of Aircraft Production was the British government position in charge of the Ministry of Aircraft Production, one of the specialised supply ministries set up by the British Government during World War II. As the name suggests, it was responsible for aircraft production for the British forces; primarily the Royal Air Force, but also the Fleet Air Arm. The DH.99 design was soon modified to incorporate a combined wood-and-metal construction in light of recommendations from the MAP; the design was thus renumbered to DH.100 by November 1941. The aircraft was considered to be a largely experimental design due to its use of a single engine and some unorthodox features, unlike the Gloster Meteor which had been specified for production early on. In February 1942, the MAP suggested dropping the project for a bomber but de Havilland stated that the twin-boom was, despite Ministry doubts, only an engineering problem to be overcome. On 22 April 1942, the construction of two prototypes (serials LZ548 and LZ551) was authorised by the Ministry while Specification E.6/41 was produced and issued to cover the work. Accordingly, the company proceeded with the detailed design work phase of the DH.100 in early 1942. 3,268 Vampires were built in 15 versions, including a twin-seat night fighter, a trainer and a carrier-based aircraft designated Sea Vampire. The Vampire was used by 31 air forces. Germany, the Netherlands, Spain and the U.S. were the only major Western powers not to use the aircraft. A number of RAF Vampires were used in active combat within the Far East during the Malayan Emergency, fought in the late 1940s and early 1950s. Specifically, the Vampire FB.5 typically undertook attack missions using a combination of rockets and bombs against insurgent targets often located in remote jungle areas throughout in Malaysia. The Vampire FB.5 became the most numerous single-seat variant of the type, 473 aircraft having been produced. The Vampire NF.10 served from 1951 to 1954 with three squadrons (23, 25 and 151) but was often flown in daytime as well as night time. After its replacement by the De Havilland Venom, these aircraft underwent conversion to the NF(T).10 standard, after which they were operated by the Central Navigation and Control School at RAF Shawbury. Other aircraft were sold on to the Indian Air Force for further use. In 1946, a single Vampire F.1 began operating on an evaluation basis in Canada at the Winter Experimental Establishment in Edmonton. The Vampire F.3 was selected as one of two types of operational fighters for the Royal Canadian Air Force (RCAF) and was first flown in Canada on 17 January 1948 where it went into service as a Central Flying School training aircraft at RCAF Station Trenton. Operating a total of 86 aircraft, the Vampire F.3 became the first jet fighter to enter RCAF service in any significant numbers. The Finnish Air Force received six FB.52 Vampires in 1953. The model was nicknamed "Vamppi" in Finnish service. An additional nine twin-seat T.55s were purchased in 1955. The aircraft were assigned to 2nd Wing at Pori, but were transferred to 1st Wing at Tikkakoski at the end of the 1950s. The last Finnish Vampire was decommissioned in 1965. On 1 September 1965, during the Indo-Pakistani War, No. 45 Squadron IAF responded to a request for strikes against a counter-attack by the Pakistani Army (Operation Grand Slam), and twelve Vampire Mk 52 fighter-bombers were successful in slowing the Pakistani advance. However, the Vampires encountered two Pakistan Air Force (PAF) F-86 Sabres, armed with air-to-air missiles; in the ensuing dogfight, the outdated Vampires were outclassed. One was shot down by ground fire and another three were shot down by Sabres. The Vampires were withdrawn from front line service after these losses. The Vampire was procured by Italy to equip the Italian Air Force. The type was licensed-manufactured by Macchi at Varese and Fiat at Turin, who constructed a total of 80 Vampire FB.52As. Italy later ordered 14 Vampire NF.10s, designated the NF.52. The Royal Norwegian Air Force (RNAF) purchased a total of 20 Vampires F.3s, 36 FB.52s and six T.55 trainers. The Vampire was in Norwegian use as a fighter from 1948 to 1957, equipping a three-squadron Vampire wing stationed at Gardermoen. In 1957, the type was withdrawn when the RNAF decided to re-equip with the Republic F-84G Thunderjet. In 1955, the Vampire trainers were replaced by the Lockheed T-33, these aircraft were returned to the United Kingdom and saw later use by the Royal Air Force. In 1946, the Swedish Air Force purchased its first batch of 70 FB 1 Vampires, having been looking for a jet-powered fighter to replace its outdated SAAB 21 and J 22 aircraft of its fighter force. In Swedish service, the Vampire received the designation J 28A, it was assigned to the Bråvalla Air Force Wing (F 13). The type soon provided such good service that the Vampire was soon selected to serve as the backbone of the fighter force. In 1949, a total of 310 of the more modern FB.50s, designated J 28B, which were based on the Vampire FB.5, were procured. The last of these was delivered in 1952, after which all piston-engined fighters were decommissioned. In addition, a total of 57 two-seater DH 115 Vampires, designated J 28C, were also used for training purposes. In 1956, the Swedish Vampires were retired from the fighter role; it was replaced in service with the J 29 (SAAB Tunnan) and J 34 (Hawker Hunter). In 1968, the final Vampire trainer was retired. Mk IV: Nene-engined project, not built. The de Havilland DH.110 Sea Vixen is a British twin-engine, twin boom-tailed, two-seat, carrier-based fleet air-defence fighter flown by the Royal Navy's Fleet Air Arm during the 1950s through the early 1970s. The Sea Vixen was designed by the de Havilland Aircraft Company during the late 1940s at its Hatfield aircraft factory in Hertfordshire, developed from the company's earlier first generation jet fighters. It was later called the Hawker Siddeley Sea Vixen after de Havilland was absorbed by the Hawker Siddeley Corporation in 1960. The Supermarine Attacker is a British single-seat naval jet fighter built by Supermarine for the Royal Navy's Fleet Air Arm (FAA). The type has the distinction of being the first jet fighter to enter operational service with the FAA. Like most other first-generation jet fighters, it had a short service life due to the rapid development of increasingly advanced aircraft during the 1950s and 1960s. The Supermarine Swift is a British single-seat jet-propelled fighter aircraft that was operated by the Royal Air Force (RAF). It was developed and manufactured by Supermarine during the 1940s and 1950s. The Swift featured many of the new jet age innovations, such as a swept wing. On 26 September 1953, a Swift F.4 piloted by Commander Mike Lithgow broke the world absolute speed record, reaching a speed of 737.7 mph (1,187 km/h); thus, the Swift was the world's fastest aircraft. The de Havilland Sea Venom is a British postwar carrier-capable jet aircraft developed from the de Havilland Venom. It served with the Royal Navy Fleet Air Arm and with the Royal Australian Navy. The French Navy operated the Aquilon, a version of the Sea Venom FAW.20 licence-built by SNCASE (Sud-Est). The Rolls-Royce RB.41 Nene is a 1940s British centrifugal compressor turbojet engine. The Nene was a complete redesign, rather than a scaled-up Rolls-Royce Derwent with a design target of 5,000 lbf, making it the most powerful engine of its era. It was Rolls-Royce's third jet engine to enter production, and first ran less than 6 months from the start of design. It was named after the River Nene in keeping with the company's tradition of naming its early jet engines after rivers. The de Havilland Ghost was the de Havilland Engine Company's second turbojet engine design to enter production and the world's first gas turbine engine to enter airline (BOAC) service. 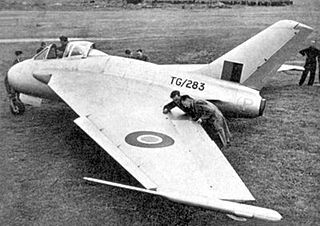 A scaled-up development of the Goblin, the Ghost powered the de Havilland Venom, de Havilland Comet and SAAB 29 Tunnan. The Air Force Museum of New Zealand, formerly called The Royal New Zealand Air Force Museum, is located at Wigram, the RNZAF's first operational base, in Christchurch, in the South Island of New Zealand. It opened on 1 April 1987 as part of the celebrations for the RNZAF's 50th anniversary, and is primarily a museum of the Royal New Zealand Air Force, its predecessor, the New Zealand Permanent Air Force and New Zealand squadrons of the Royal Air Force. The de Havilland DH 108 "Swallow" was a British experimental aircraft designed by John Carver Meadows Frost in October 1945. The DH 108 featured a tailless, swept wing with a single vertical stabilizer, similar to the layout of the wartime German Messerschmitt Me 163 Komet rocket-powered point-defence interceptor. Initially designed to evaluate swept wing handling characteristics at low and high subsonic speeds for the proposed early tailless design of the Comet airliner, three examples of the DH 108 were built to Air Ministry specifications E.1/45 and E.11/45. With the adoption of a conventional tail for the Comet, the aircraft were used instead to investigate swept wing handling up to supersonic speeds. All three prototypes were lost in fatal crashes. The Saab 21R was a Swedish twin-boom fighter/attack aircraft developed and produced by Saab. It was a jet-powered development of the earlier piston-engined 21. It was the first jet aircraft to be produced by Saab. Along with the Russian Yakovlev Yak-15, the 21R was one of only two jet fighters to have been successfully converted from a piston-powered aircraft. The Queensland Air Museum is a not-for-profit community owned aviation museum located at Caloundra Airport in Queensland, Australia. Its mission is to collect and preserve all aspects of aviation heritage with an emphasis on Australia and Queensland. The museum has the largest collection of historical aircraft in Queensland and it also has a large collection of aircraft engines, equipment, artefacts, photographs and books. ↑ Gunston 1981, p. 52. ↑ Mason 1965, pp. 10, 12. ↑ Gunston 2006, p. 62. 1 2 Buttler 2000, p. 201. 1 2 Buttler 2004, p. 201. 1 2 3 4 5 6 7 8 9 10 11 12 13 14 15 16 17 18 19 20 21 22 23 24 25 26 27 28 29 30 31 32 33 34 35 36 37 38 39 40 "De Havilland DH100 Vampire." BAE Systems , Retrieved: 18 May 2017. ↑ Buttler 2004 p. 203. ↑ Gunston 1981, p. 49. 1 2 3 4 5 6 7 8 9 10 11 12 13 14 15 16 17 18 Mason 1965, p. 3. ↑ Gunston 1981, p. 50. 1 2 Jackson 1987, p. 484. ↑ Jackson 1987, pp. 496—501. ↑ Harvey, Heyworth & Jackson 2006, p. 109. ↑ Harker 1976, p. 79. 1 2 3 4 Gunston 1991, p. 173. ↑ Gunston 1992, p. 454. ↑ Brown 1985, pp. 32–34. 1 2 Cooper 2008, pp. 197–204. ↑ Brown 1976, pp. 126–7. 1 2 3 4 5 Mason 1965, p. 7. ↑ Brown 1976, pp. 132–6. ↑ Jackson 1987, p. 424. ↑ Dorr 1998, p. 119. 1 2 3 4 5 6 7 8 Mason 1965, p. 10. 1 2 3 4 5 6 7 8 9 Mason 1965, p. 8. ↑ Mason 1965, pp. 8, 10. ↑ Watkins 1996, p. 58. ↑ Mason 1965, pp. 3, 12. ↑ Mason 1965, pp. 3–4. 1 2 3 4 Mason 1965, p. 4. 1 2 3 Mason 1965, p. 5. 1 2 3 Jackson 1987, p. 499. ↑ Mason 1965, p. 6. ↑ Mason 1965, pp. 6–7. ↑ Jackson 1987, pp. 429–430. ↑ Mason 1965, pp. 7–8. ↑ Watkins 2013, p. 1926. ↑ "RAAF Museum: RAAF Aircraft Series 2 A79 DHA Vampire". airforce.gov.au. Retrieved 28 January 2017. ↑ Milberry 1984, p. 212. ↑ Milberry 1984, pp. 212, 215. ↑ Nicolle & Cattaneo 1997, p. 2. ↑ Jackson 1987, p. 432. ↑ Nicolle & Cattaneo 1997, pp. 2–3. ↑ Nicolle & Cattaneo 1997, p. 3. ↑ Nicolle & Cattaneo 1997, pp. 3–4. ↑ Birtles 1986, p. 37. ↑ Birtles 1986, p. 59. ↑ Nicolle & Cattaneo 1997, p. 6. ↑ Nicolle & Cattaneo 1997, pp. 6–8. ↑ Nicolle & Cattaneo 1997, pp. 8, 10. ↑ "Attributed Israeli Air Combat Victories" . Retrieved 7 July 2016. ↑ Nicolle & Cattaneo 1997, pp. 10–11. ↑ "Vampires for France". The Times (51284). London. 20 January 1949. p. 4. 1 2 3 Jackson 1987, p. 428. ↑ (Retd), Sqn Ldr Ian S Loughran. "Four Sorties over Goa" . Retrieved 7 July 2016. ↑ (Retd), Air Marshal Trilochan Singh PVSM AVSM VrC VM. "Tank Busting In The Chamb" . Retrieved 7 July 2016. ↑ Thomas 2005, pp. 30, 32. ↑ Thomas 2005, pp. 32–5. ↑ Thomas 2005, pp. 36–7. ↑ Thomas 2005, p. 39. ↑ "Vampires to be built in Switzerland". The Times (51303). London. 11 February 1949. p. 2. ↑ Jackson 1987, p. 485. ↑ "de Havilland Vampire in Swedish service". ↑ Brown 1976, p. 130. ↑ "De Havilland DH115 Vampire Trainer". BAE Systems - International. ↑ "ADF-Serials Vampire". Adf-serials.com.au. Retrieved 2018-09-20. ↑ "RAAF leased Vampire FB.9 and Meteor T.7". Adf-gallery.com.au. Retrieved 2018-09-20. ↑ "NZDF-Serials DH.100 Vampire". Adf-serials.com.au. Retrieved 2018-09-20. ↑ Illustrated Encyclopedia of Aircraft 1985, p. 1380. ↑ Mason 1965, p. 12. 1 2 Jackson 1987, p. 431. Bain, Gordon (1992). De Havilland: A Pictorial Tribute. London: AirLife. ISBN 978-1-85648-243-1. Birtles, Philip (1986). De Havilland Vampire, Venom and Sea Vixen. London: Ian Allan. ISBN 978-0-7110-1566-1. Buttler, Tony (2000). British Secret Projects: Jet Fighters Since 1950. Leicester, UK: Midland. ISBN 978-1-85780-095-1. .
Buttler, Tony (2004). British Secret Projects: Fighters & Bombers 1935–1950. Hinckley, UK: Midland. ISBN 978-1-85780-179-8.
Cooper, Geoffrey G. J. (2008). Farnborough and the Fleet Air Arm. Ian Allan. ISBN 978-1-85780-306-8. Gunston, Bill (1981). Fighters of the Fifties. Cambridge, UK: Patrick Stephens. ISBN 978-0-85059-463-8. Gunston, Bill (1991). Plane Speaking. Cambridge: Patrick Stephens. ISBN 978-1-85260-166-9. Gunston, Bill (1992). Vampire Fighters Lead Victory Day Fly-by. The Chronicle of Aviation. et al. Liberty, MO: JL. ISBN 978-1-872031-30-9. Gunston, Bill (2006). World Encyclopedia of Aero Engines: From the Pioneers to the Present Day. London: Sutton. ISBN 978-0-7509-4479-3. Harrison, W. A. (2000). De Havilland Vampire. Warpaint. Buckinghamshire, UK: Hall Park Books. OCLC 65202533. Harker, R.W. (1976). Rolls-Royce From the Wings: Military Aviation, 1925–71. Oxford: Oxford Illustrated Press. ISBN 978-0-902280-38-0. Jackson, R. (2006). Men Of Power, The Lives Of Rolls-Royce Chief Test Pilots. Barnsley: Pen and Sword. ISBN 978-1-84415-427-2. Illustrated Encyclopedia of Aircraft. Part Work 1982–1985. London: Orbis. 1985. OCLC 774502902. Jackson, A. J. (1987). De Havilland Aircraft since 1909 (3rd ed.). London: Putnam. ISBN 978-0-85177-802-0. Mason, Francis K. (1965). The De Havilland Vampire Mk. 5 & 9. Aircraft in Profile. Leatherhead, UK: Profile Publications. OCLC 45318860. Marriott, Leo (1985). Royal Navy Aircraft Carriers 1945–1990. London: Ian Allan. ISBN 978-0-7110-1561-6. Milberry, Lawrence "Larry" (1984). Sixty Years: The RCAF and Air Command 1924–1984. Toronto: Canav Books. ISBN 978-0-07-549484-3. Watkins, David (1996). de Havilland Vampire: The Complete History. Thrupp UK: Budding Books. ISBN 978-1-84015-023-0. Watkins, David (2013). The History of the de Havilland Vampire. Stroud, UK: Fonthill Media. ISBN 978-1-78155-266-7. Brown, Eric (1976). "Vampire on a Trampoline". Air Enthusiast Quarterly . Bromley, UK: Fine Scroll (2): 126–136. ISSN 0143-5450. Brown, Eric (January 1985). "Dawn of the Carrier Jet". Air International . 28 (1): 31–37. ISSN 0306-5634. Dorr, Robert F. (1998). "Lockheed P-80 Shooting Star, Variant Briefing". Wings of Fame: The Journal of Classic Combat Aircraft. London: AIRTime. 11. ISBN 978-1-86184-017-2. Thomas, Andrew (September–October 2005). "'Booms' Over the 'Bush': De Havilland Vampires in Rhodesian Service". Air Enthusiast . Stamford, UK: Key Publishing (119): 30–39. ISSN 0143-5450. Wikimedia Commons has media related to De Havilland Vampire . Autobiography of Bill Wood, who was part of the team that crossed the Atlantic by jet for the first time.